Toronto, April 19, 2009… HonestReporting Canada (HRC) denounced cartoons printed in the YU Free Press, York University’s “alternative” campus newspaper this month as “grossly anti-Semitic” because of their portrayal of Israel using Nazi-like imagery, while urging York administrators to carry out a formal investigation and to remove this newspaper from the school’s grounds. Created by anti-Israel cartoonist Carlos Latuff, the odious cartoons were appended to a Q & A between Latuff and YUFP’s Ali Mustafa who described having the “privilege of meeting” Latuff in person, while mentioning that his views were “very provocative.” The first cartoon portrays menacing S.S. troopers summarily executing innocent Palestinians in open-air graves marked “Gaza,” all while figures symbolizing the U.S., Saudi Arabia, and the world stand idly by. 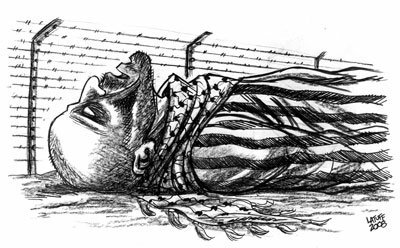 The second cartoon depicts an emaciated Palestinian dressed in a pinstriped uniform similar to those warn during the Holocaust, lying on the ground next to Israel’s security barrier which eerily looks like the barbed wire fence of a concentration camp. The dangerous implication promoted by these cartoons is of an Israeli policy to perpetrate a Holocaust against the Palestinians. “Carlos Latuff’s use of Nazi-like imagery to portray Israel’s defensive military operations against Hamas in Gaza are grossly anti-Semitic. Comparing Israeli policy and actions to that of the Nazis fits the European Union’s and U.S. State Department’s working definition of anti-Semitism. The cartoons mirror classic anti-Semitic propaganda of 1930’s Nazi Germany which encouraged millions to hate, helping to lay the foundation for the Nazi genocide. 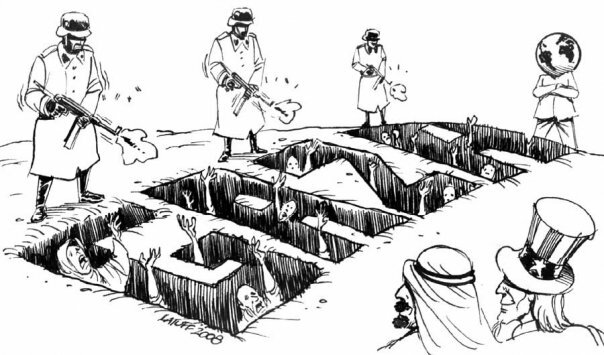 To view these cartoons online please click here and here. For more information, please contact HonestReporting Canada at: info@hrc.leverage.it or (416) 915-9157. If you would like to ask York University administrators to remove this newspaper, which was produced and housed on the school grounds, from York’s greater campus and to carry out a formal investigation, please contact York University President and Vice-Chancellor Mamdouh Shoukri at: mshoukri@yorku.ca.